With six guest rooms, Palm Beach Bed and Breakfast is a spacious double-story beach themed retreat. Complimentary continental breakfasts are provided, with a selection of breads and spreads (Jams, Marmalade, Vegemite, Honey, Nutella and Peanut Butter etc. ), cereals, ham, cheese, eggs, fresh fruit and yoghurts. We also provide unlimited tea, coffee, fruit juice and bottled water. For the discerning coffee connoisseur, filtered coffee makers and coffee plungers are available. Each room has its own reverse cycle air-conditioning unit, fridge, free Wi-Fi and Smart TV with full access to Netflix. Irons, ironing boards and clothes airers are provided in each room. Hair dryers, shampoo/conditioner and toiletries are provided in each bathroom. On the ground floor, Rooms 3, 4 and 5 have their own kitchenettes with microwave ovens, kettles and toasters. These rooms also have their own private access, separate from the main house entry. We are a pet friendly establishment and will accept small dogs, free of charge, in these rooms. Rooms 3&4 can be separated from the main house and utilised as a 2 bedroom self- contained unit, ideal for families. The large open plan upper floor contains Rooms 6 and 7. Room number 6 has ample room for an additional fold-out single bed, and also includes a Spa Bath within the ensuite/shower room. Room 7 is a spacious family room with a queen size bed and 2 single beds, also with ample room for an additional fold-out single bed. The upper floor contains a lounge room incorporating a smart TV, with Netflix access and DVD player and a fully equipped communal kitchen. A front loading washing machine is provided for guests use. Adjacent to the kitchen is a 6 seating dining area. Off the lounge is a balcony, with a 6 seater outside dining setting for alfresco dining overlooking the garden with an alfresco dining area, beneath a cool shady patio, and complimentary use of a gas BBQ. 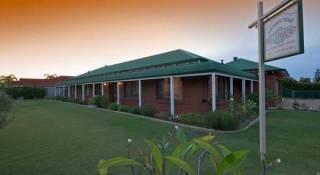 Our Bed and Breakfast accommodation is perfectly suitable for travellers of any kind and we are well equipped and experienced in providing tailored packages catering to your personal needs. 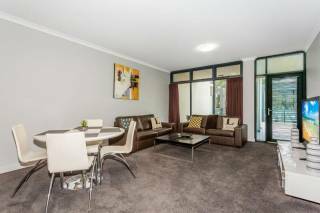 Just a 4 minute walk from a safe, family friendly beachfront and park, with beautiful scenery, dolphins and some of Perth's premier fishing. You can walk along the foreshore strip to experience casual or fine dining at many of Rockingham's award winning restaurants, cafes, wine bars and pubs, or you may wish to make use of the free communal BBQ facilities located in the picturesque parks along the coastline. Room 7- Bedlam: 1 X Queen Bed plus 2 X Single Beds (Additional beds an be accomodated upon request), Private ensuite, front door access. Room 6- Bridge (Spa Room): 1 X Queen Bed (Additional single beds provided upon request), Private ensuite incl. spa, front door access. Room 5- Aviary: 1 X Queen Bed, (Additional single beds provided upon request) Private ensuite, Private entrance. Room 4 Arch: 1 X Queen Bed (Additional single beds provided upon request) Private ensuite, Private entrance. Room 3 Queen Deluxe: 1 X Queen Bed with fully equipped kitchen (oven/stove incl. ), Private ensuite, Private entrance. Room 2 Queen Standard: 1 X Queen Bed, Private bathroom across the hallway, front door access. Upstairs guest lounge/ kitchen area that can be utilised for conference's upon request and confirmation from Palm Beach Bed & Breakfast to accommodate. Free parking at property and close by (on street bays). Please inform if you need parking at the property and we will endeavour to accommodate. Check in at front door from 2pm until 8pm on check in day. Call to confirm check in time.